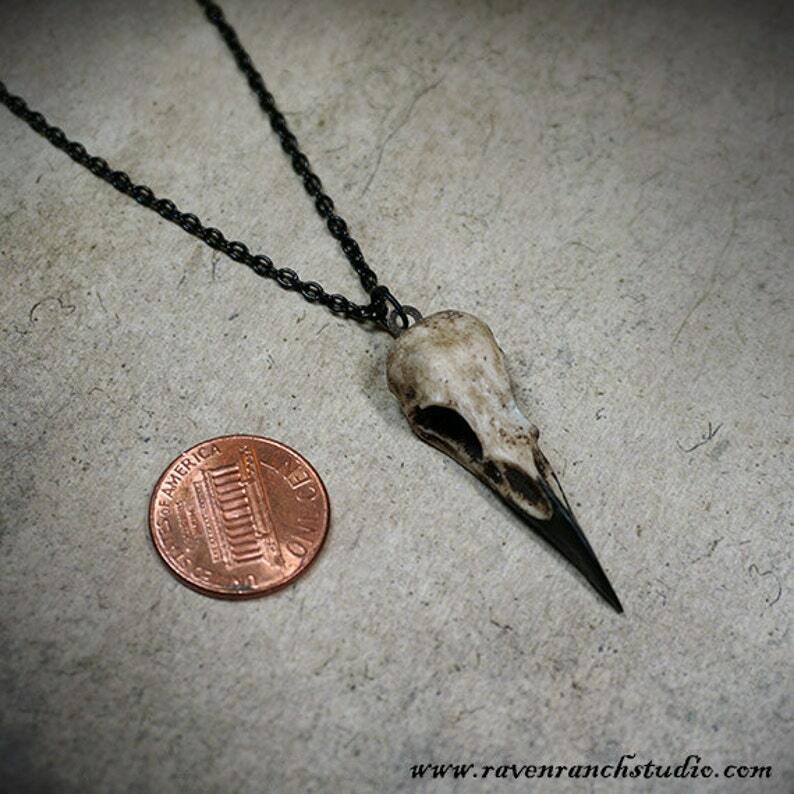 Bird Skull Necklace: 1.5" (3.81cm) Resin Raven Skull (Aged Finish with Painted Black Beak) on a Black Chain. Cast of durable urethane resin from a real raven skull and then shrunk down to a small size (the original skull was 3.5" before it was shrunk down to this 1.5" size). All of the same fine detail and proportions are captured in the mini version of this beautiful raven skull. Looks just like the real thing. These are hand made, lightly sanded, and painted to get an aged finish look. This skull replica also has a hand painted black beak. Due to the nature of handmade work, there might be a slight variation with each item. A small eye-pin screw has been drilled into the top of the skull so it can be hung from an 18" (45.72cm) black enamel plated chain with lobster claw clasp. If you would like it in another length just let me know. The skull replica itself measures approximately 1.5" (3.81cm) long. Shipped in a cotton filled jewelry gift box, ready for gift giving. ******** Looking for a slightly larger version? I haven't taken this necklace off since receiving it. Ok, the chain was a little flimsy, but the skull itself is awesome, and the chain easily replaced with a black cord. I'll be back for more of these. Perfect size for me, I wear it everyday, I love it! Loved it! I’ve gotten sooo many compliments on the necklace!